I first started taking birth control my senior year of high school, which would mean that I have been on it for almost 5 years. It wasn’t until I took a course on women’s health issues my spring semester of my junior year, that I gathered a complete knowledge of exactly what birth control does for a woman’s body. Sad right? Yes, I readily admit that I was ignorant and should have made sure that I knew exactly what I was putting in my body. But this one class period in general was mind-blowing because we learned about all the different types of contraceptive methods, which I don’t know about you, but my high school health class wasn’t passing around diaphragms and NuvaRings. In my defense, I feel like it’s common knowledge that young women generally go on the pill, rather than other forms of birth control, for 3 reasons: to lessen the chances of pregnancy, clear up worse than normal acne or regulation and relief of the menstrual cycle. Granted I was mainly on it to regulate my period but I never asked nor was I informed on how this miracle pill did all that it can do. I know from talking to many of my friends, female and male, that I wasn’t the only one that was living in the dark. Now for those of you who don’t know, there are two types of birth control pills, the combination pill and the mini pill. Most women, especially of our age range, are on combination pills, which contain both estrogen and progestin. These two hormones work together to suppress ovulation or the releasing of an unfertilized egg from a female’s ovary. They also thin the lining of the uterus which lowers the probability of implantation occurring and thickens the cervical mucus which makes it much more difficult for sperm to get through. Now I would definitely consider that a triple threat, on top of easing symptoms of PMS, minimizing bleeding and clearing up acne. The mini pill acts similarly but only contains progestin which only stops ovulation about half the time. So now that we’ve had the brief anatomy lesson, apologies if it was too detailed for some people but that’s how the pill works wonders for a female’s body, I had to go there. Gender norms are present everywhere we turn and as women we are trained to be passive, subservient and accept decisions that are being made for us. Who make up majority of the lawmakers and members of congress that are supposed to be representing us women? Men. Who, on average, are employed more in high schools and colleges that dictate what young men and women learn at a sexually active age? Men. Who often dominate the medical field? Men. Who are most medications and health conditions tested on and for? Men. This is not a coincidental correlation. I recently read an article about how Oklahoma is attempting to deny women affordable birth control because it is “poisoning their bodies” and suppressing who they are because “part of their identity is the potential to be a mother.” First of all, this is nonsense because the birth control pill was approved by the FDA in 1960 and has only improved throughout the decades. It’s amazing to see how men in positions of power think they are allowed to make choices for women about women’s bodies. 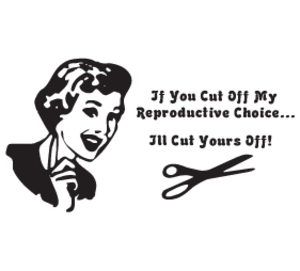 We as women should have the right to choose whether we want to regulate our reproductive abilities, whether we ever want to have children, whether we abort unwanted or accidental pregnancies, we as human beings have the right to make the decisions that ultimately affect us directly. How does the issue of women’s reproductive rights, even remotely, seem like something that should be decided by anyone other than women? Such a great post! I just don’t understand why we wouldn’t have the pill over-the-counter…REALLY. Thank you and I completely agree!